For the 24 hours to 23:00 GMT, the AUD rose 0.25% against the USD and closed at 0.7189. LME Copper prices rose 1.7% or $100.0/MT to $5991.0/MT. Aluminium prices rose 1.7% or $33.0/MT to $2014.5/MT. In the Asian session, at GMT0300, the pair is trading at 0.7191, with the AUD trading slightly higher against the USD from yesterday’s close. Elsewhere in China, Australia’s largest trading partner, retail sales surged 9.0% on a yearly basis in August, more than market consensus for an advance of 8.8%. Retail sales had advanced 8.8% in the prior month. Moreover, the nation’s industrial production jumped 6.1% on an annual basis in August, in line with market forecast and compared to a gain of 6.0% in the preceding month. 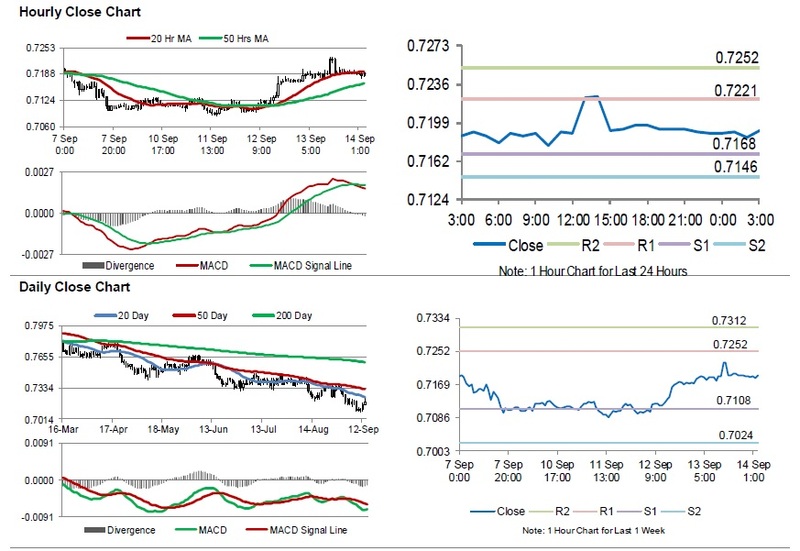 The pair is expected to find support at 0.7168, and a fall through could take it to the next support level of 0.7146. The pair is expected to find its first resistance at 0.7221, and a rise through could take it to the next resistance level of 0.7252.